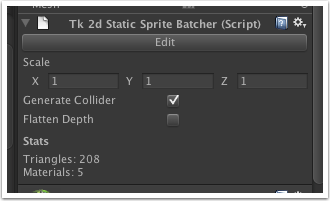 Edit/Commit - edit or commit the static sprite batcher. Scale - scales the static sprite batcher by changing the geometry generated. Generate Collider - when ticked, a mesh collider will be generated containing all other sprites. Flatten Depth - when ticked, the z depth in your sprites will be collapsed, but the draw order will be retained.